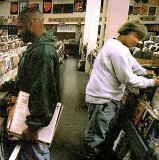 New to DJ Shadow? Start here: I would recommend DJ Shadow Entroducing. Front to back, it’s stellar. You can listen to it 20 times and not catch all the subtleties. It’s a piece of fine, modern art. A masterpiece in every sense of the word.